Mayor Frederick Conboy greeting General Knox on the steps of City Hall. City of Toronto Archives, Fonds 1257, Series 1057, Item 3308. “The only motive that a sane man can have for entering Civic public life is a desire to render a real service, and that means constant work and great anxiety.” So said Frederick J. Conboy to city council in January of 1945, at the conclusion of four consecutive one-year terms as mayor of Toronto. Conboy’s time in office marked the apex of a long public-service career with roots in public-health dentistry. 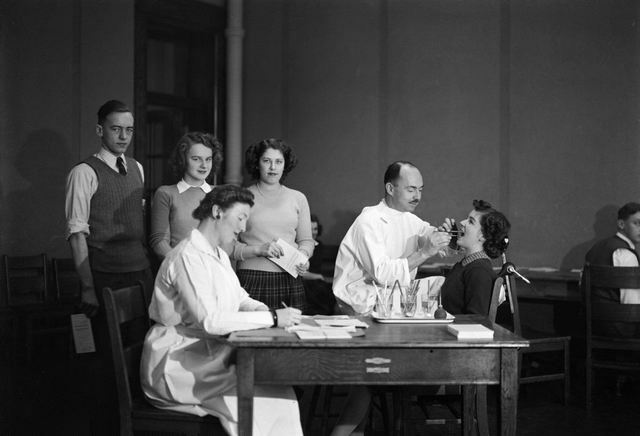 High school students receiving dental examinations in 1942. This photo appears to show a service offered by the City’s Health Department, as opposed to that offered by the school board. City of Toronto Archives, Fonds 200, Series 372, Subseries 32, Item 921. In 1909, Conboy won a seat as a school trustee. While also attending to other education business, one of Conboy’s earliest campaigns was for the Board of Education to recognize dentists’ certificates of illness with respect to absent teachers, arguing that a dentist’s certificate should count as much as a physician’s. It was during his time as a trustee that the school board introduced dental inspections; The Journal of the Ontario Dental Association later wrote that Conboy’s advocacy was “largely instrumental” in getting this service implemented. In addition to his dental interests, Conboy soon proved himself a skilled leader and administrator, and in January of 1912 he was elected chairman of the Board of Education, reportedly the youngest person to date to hold this position. Following his time as a school trustee, Conboy lectured at the School of Dentistry, and was soon an active member with many professional organizations and committees. During the First World War, he began contributing to the journal Oral Health, in part by editing “Pro Bono Publico,” a regular column that proclaimed to feature “dental information in a form suitable for publication in the public press.” Many of his contributions to Oral Health focussed on paediatric dentistry, and the role he believed that government had in ensuring universal access to dental care. In 1923, Conboy served a term as president of the Ontario Dental Association, after which he assumed the role of the organization’s secretary-treasurer. Among other contributions to the ODA, he initiated and edited a monthly publication called The Booster, which later changed its name to The Journal of the Ontario Dental Association, and, subsequently, Ontario Dentist. While serving as the Ontario Dental Association’s president, Conboy invited Dr. Forbes Godfrey, newly installed as Ontario’s first-ever Minister of Health, to speak at the ODA’s annual convention. Godfrey spoke of the need to promote oral health and vowed to establish a dental division within his portfolio. This promise came to fruition in 1925, when Godfrey named Conboy as Ontario’s director of dental services. The purpose of this new position, as stated by the Globe, was to apply “the modern science of preventive dentistry to the needs of the public generally, and to children of school age particularly.” Over the next 10 years, Conboy used this role to advance public dental health education throughout Ontario using a variety of methods. In 1926, Conboy established October 20 as “Dental Health Day.” In addition to free dental clinics offered in Toronto, events reported in the Star included “radio talks, addresses to service clubs, and window displays,” as well as a “public dental health concert.” The Province also prepared an educational film that was distributed to Ontario movie theatres. Group photo of members of the Ontario Dental Association, May 20, 1930. From left to right: Dr. T.F. Campbell of Galt; Dr. A.W. Ellis of Toronto; Dr. F.L. Henry of Oshawa; and Frederick L. Conboy of Toronto. City of Toronto Archives, Fonds 1266, Item 20334. 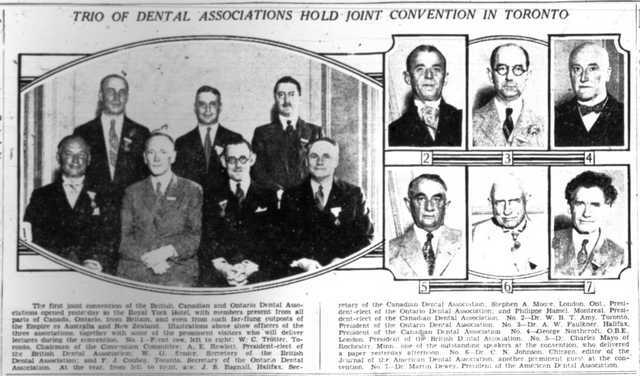 Coverage of the 1932 joint dental convention. Conboy is in the group photo on the left, front row, far right. The Globe, August 9, 1932. After serving as the Ontario dental director, Conboy turned his eye to municipal politics, and landed a seat on city council in 1935. 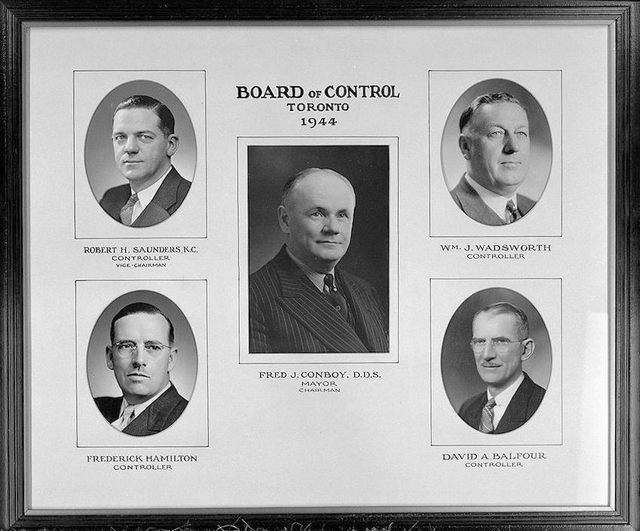 Prior to the 1950s, Toronto held municipal elections on an annual basis; Conboy was reelected to Council the following year, after which he ran for and won a seat on Toronto’s elected executive committee, the Board of Control. Conboy quickly proved a skilled and popular member of both city council and the board of control, gaining a reputation as a politician who got things done and worked well with his fellow officials. In addition to public-health advocacy, Conboy was noted for his support of the development of the Island airport and for his efforts in slum clearance. 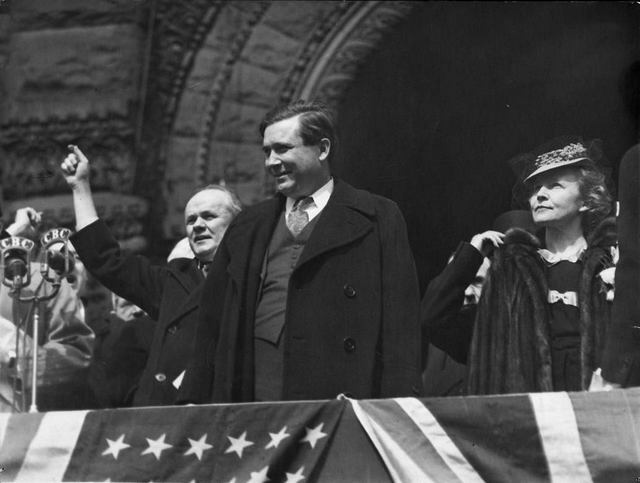 Frederick Conboy at City Hall with visiting U.S. politician Wendell Willkie. City of Toronto Archives, Fonds 1244, Item 8109. When incumbent Ralph Day announced he would not seek reelection in 1941, Conboy declared himself a candidate for mayor, promising improved financial administration and dedication to the war effort. 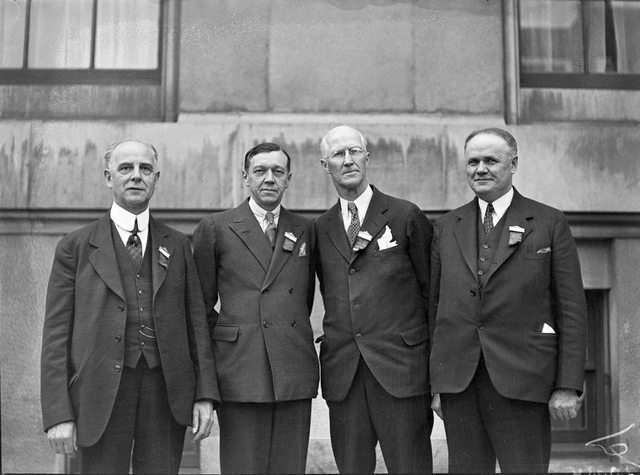 All three major Toronto newspapers endorsed Conboy over fellow board of control member Douglas McNish, and Conboy was duly elected with more than 62 percent of the cast vote. Conboy’s other actions as mayor included efforts to improve public safety, resulting in increased street lighting and changes to the existing traffic laws. Reflecting on his time in his office, newspapers also noted his capable response to the 1944 snowstorm, and his work to improve the quality of housing in the city, all while managing to lower the City’s debt. Frederick Conboy showing City Hall to stage and screen actress Anna Neagle. City of Toronto Archives, Fonds 1257, Series 1057, Item 3886. After running unopposed for mayor in 1942 and 1943, and defeating the Co-operative Commonwealth Federation–affiliated Lewis Duncan in 1944, Conboy sought a fifth term in office, challenged by board of control member Robert Hood Saunders. 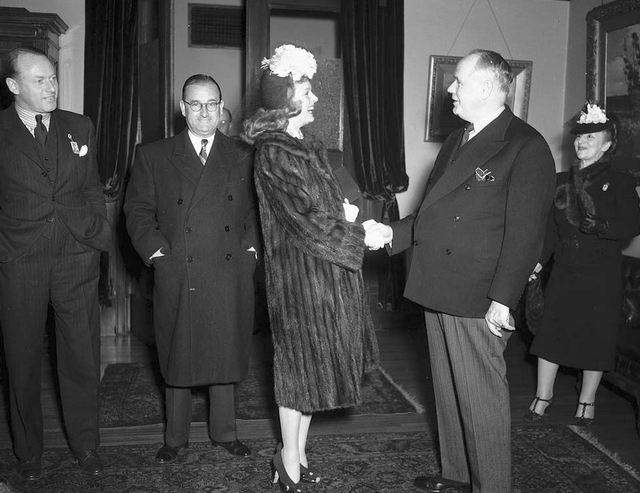 Conboy and Saunders reportedly worked well together in municipal politics, and the Toronto press agreed that both were very similar candidates with good civic records. The Telegram renewed its endorsement of Conboy, but both the Star and the Globe and Mail, while praising Conboy’s work in office and admitting that Saunders and Conboy were very much alike and equally qualified for the post, opted to throw their support behind Saunders. “The Globe and Mail believes that Dr. Conboy, after holding the office of chief magistrate for four years, might well concede the right of someone else to occupy this honourable—and exacting—post, and considers that Mr. Saunders merits the promotion,” ran one editorial. The Toronto Star went further: “Men who enter Toronto’s public life should be able to look forward to promotion if their abilities and services warrant it. If the path to promotion is blocked by the man ‘at the head of the line’ staying on and on and on and on—and still another ‘on,’ a fifth, if Conboy has his way—those who legitimately seek to move up are blocked. They shouldn’t be. 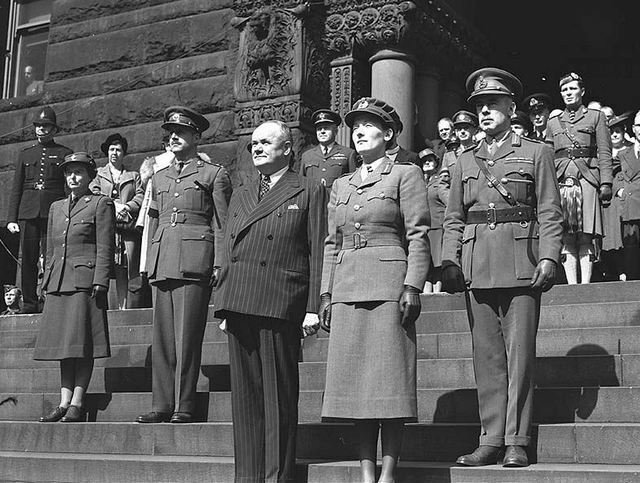 The mayoralty should not be regarded as any man’s private perquisite, if equally good or better men are ready to succeed him.” Although the Telegram rejected these arguments, the public apparently agreed that a change was needed, and Saunders assumed the mayoralty in 1945. Composite of Mayor Conboy and the Board of Control in 1944, including Robert Hood Saunders. City of Toronto Archives, Fonds 200, Series 372, Subseries 41, Item 500. Conboy remained active as a dental advocate following his electoral defeat, and soon announced plans to become an insurance broker. He re-entered the political arena in 1948, standing as the Progressive Conservative candidate for Bracondale in the provincial election. Although George Drew’s Conservatives retained their majority government, Conboy was defeated by CCF candidate Harry Walters. Additional material from: Additional material from: The Globe [and Mail] (January 4, May 7, 1909; November 25, 1910; January 5, 1912; November 21, 1917; August 24, 1920; May 17, 1923; January 29, May 28, December 28, 1925; September 8, 1928; August 17, 1929; May 29, July 9, September 5, 1931; January 21, August 9, 1932; July 28, 1934; December 2, 1936; September 2, 1938; December 21, December 30, 1940; August 20, December 2, December 3, December 17, December 29, 1943; October 24, December 7, December 27, 1944; March 8, 1945; March 30, 1949); Barry Gough, Through Water, Ice & Fire: Schooner Nancy of the War of 1812 (Dundurn, 2006: Toronto); Francesca Grosso, The History of Sunnybrook Hospital: Battle to Greatness (Dundurn, 2014: Toronto); D.W. Gullett, A History of Dentistry in Canada (University of Toronto, 1971); The Journal of the Canadian Dental Association (May 1949); The Journal of the Ontario Dental Association (May 1949); Heather MacDougall, Activists and Advocates: Toronto’s Health Department, 1883-1983 (Dundurn, 1990: Toronto); Oral Health, Vol. 18 (1918); The Public Health Journal, Vol. 17, No. 10 (October 1926); James W. Shosenberg, The Rise of the Ontario Dental Association: 125 Years of Organized Dentistry (Ontario Dental Association: 1992); The Toronto Star (September 28, 1905; May 8, 1909; May 17, 1923; January 29, April 15, December 28, 1925; January 14, 1929; July 24, July 25, 1931; January 31, 1932; October 31, 1933; December 31, 1934; October 2, December 11, December 30, 1940; August 12, 1943; October 31, December 8, December 13, December 19, December 22, December 29, 1944; January 2, 1945; June 3, 1948; March 29, March 30, 1949); The Evening Telegram (January 29, 1925; August 9, 1932; December 31, 1940; December 27, December 31, 1943; December 29, December 30, 1944; March 29, 1949).